American LegalNet, the premier provider of "Desktop to Courthouse" workflow technologies, is an eFiling Service Provider (EFSP) for Civil and Small Claims litigants for the Superior Court of California, County of Orange. 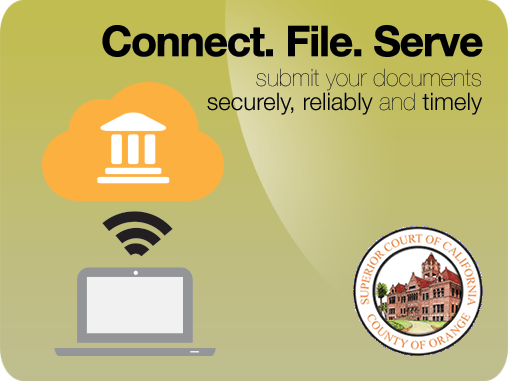 Through the Orange County eFiling Portal, legal documents can be filed in compliance with the California state-wide electronic filing standards (2GEFS). The eFiling Portal also integrates with the court’s CCMS system. eFile multiple documents in a single case for $9.95 per transaction. Volume discounts are available, contact us for more details. Our eFiling portal service provides any individual with a disability, upon request, an accommodation to enable the individual to file and serve documents electronically at no additional charge. If you would like an accommodation for our services or have a complaint concerning accessibility, please contact Sarah Granados at 818-817-9225 or send an email at sgranados@alncorp.com. Now offering eServe for as low as 89 cents which will allow you to electronically serve and file documents all in the same transaction! © Copyright 2019 American LegalNet, Inc. All rights reserved.